The nearly rotten bananas strike again! 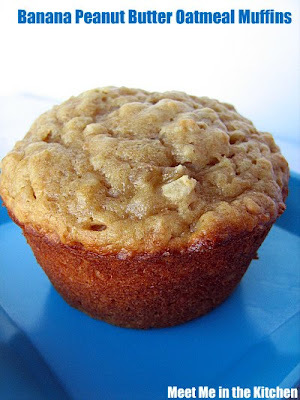 I had to use a couple of bananas after going out of town for the weekend and wanted to make a healthy muffin. I searched online for a recipe and found this great one from Baking Bites. It had a small amount of oil and combined peanut butter with banana. Everything is better with peanut butter, in my opinion. I really liked that they had oatmeal in them too- it meant they could be an option for breakfast. I used low-fat buttermilk and we ate these warm out of the oven for breakfast. We didn't top them with anything. They were really good. Nice flavor and texture. I froze half of them because I knew my family was coming to visit and there are a few members of my fam who are obsessed with peanut butter. And a few who love muffins. They are really great out of the freezer too! 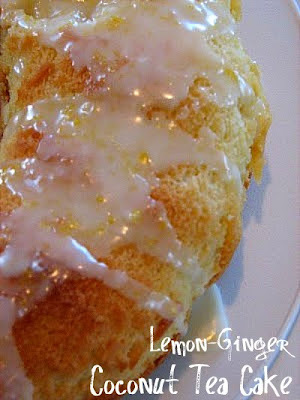 This week's TWD recipe, Coconut Tea Cake, was chosen by Carmen who blogs over at Carmen Cooks. You can find the recipe on her blog. 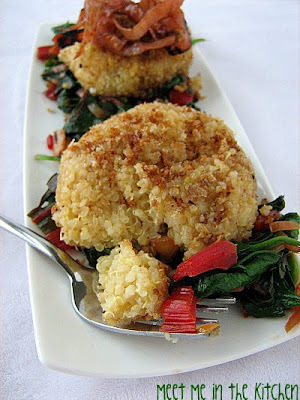 Or you can go to one of the links I have from when I made this recipe previously. 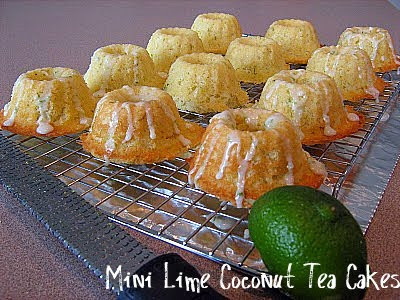 I have made this recipe twice before; I made mini lime bundt cakes and a regular sized Lemon-Ginger Bundt, both times because I had leftover coconut milk that I needed to use. Basically, Dorie's book is the first thing I turn to if I need to bake something or if I have leftover ingredients that could be used for baking. Both times I made this cake it was delicious. Both times I made a simple glaze. It was a hit both times. Check out the TWD Blogroll to see what other variations people made of this cake! Today is my younger brother's 18th birthday and I am so thrilled that he is here with me to celebrate! I am going to bake him an awesome cake and we are going to have a fun day~ Happy Birthday Andrew!!!! The past couple months, I have had the opportunity to cook and serve dinner at a local homeless shelter. I have been blessed with great people who are willing to help me out in this endeavor and it has been really rewarding for us. It is a temporary shelter, that operates in the colder months of the year. It has been really great to have the opportunity to help those in need. This is what we served for dinner a couple of weeks ago at the shelter. I don't usually use canned pasta sauce when I am cooking. I prefer to make my own. But I multiplied this recipe by 6 to get a large enough amount to serve and this time, I used a shortcut by using prepared sauce. I had to prepare other things for the dinner too, so using prepared sauce was a time saver for me this time. 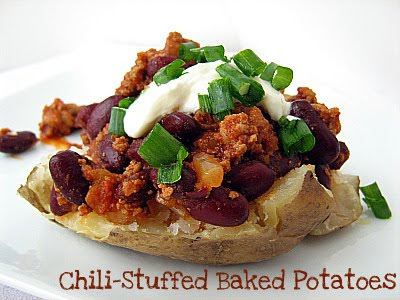 I saved a small amount of the chili and a few baked potatoes, so that we could have dinner too. I had to doctor up the sauce with some extra spices because it needed some flavor, but after adding garlic powder, oregano and some pepper, it turned out being a pretty great topping for the baked potatoes. When we served these at the shelter we had shredded cheese and sour cream as toppings, but here at home I used greek yogurt and chopped green onions. I used ground turkey instead of ground beef because that is what I do. The good thing about this recipe is that you could adapt it anyway you want and could sub in homemade sauce if you wanted to. It sure worked out for me when we had to feed a lot of people! Brown ground turkey with onion in 12-inch skillet, stirring occasionally, 8 minutes or until onion is tender; drain if desired. Stir in chili powder and cook 30 seconds. Stir in beans, Ragu® Old World Style® Pasta Sauce and other spices. Bring to a boil over high heat. Reduce heat to low and simmer, stirring occasionally, 5 minutes or until heated through. Evenly top hot potatoes with ground turkey mixture. Garnish, if desired, with diced avocado, sour cream (I used greek yogurt for mine), chopped green onions, and shredded cheddar cheese. What do you do with leftover rice? I had some brown rice leftover after I made Caribbean Red Beans and Brown Rice and knew right away that I was going to use it to make some version of fried rice. I really wanted to make a vegetable version and found a great recipe online. I just wanted to add a couple more vegetables and ended up doing the recipe my way. I adapted the recipe according to what I did and also included a link for the original recipe. We had this alongside the salmon in the previous post and it was a really great combination and a really delicious dinner. There was enough leftover from this recipe, that I was able to add some cooked, chopped chicken to it and it provided us with another dinner later in the week. I love it when that happens. Heat canola oil in the pan over medium-high; add mushrooms and cook for two minutes. Add asparagus, bell pepper, scallions, garlic and ginger; cook, stirring, until the vegetables are just tender, about 2 minutes. Scoot all the veggies to one side of your pan and add eggs. Cook and scramble for about 1 minute. Mix into vegetables. 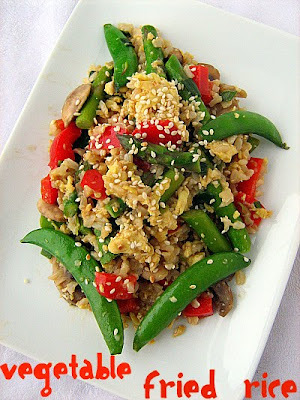 Add the cooked rice, soy sauce, vinegar and sugar snap peas to the pan; cook until the liquid is absorbed, 1-2 minutes. Remove from the heat; stir in sesame oil and sprinkle with the toasted sesame seeds. I wanted to cook some fish for dinner the other night to accompany our vegetable fried rice (that recipe is coming soon). I did a quick internet search and found a recipe from The Barefoot Contessa that looked great. It was for grilled salmon, but I read in some of the reviews that people had baked it with good results. The marinade was really quick, with just a few ingredients. It sounded a little strange to combine dijon mustard and soy sauce, but I knew it would be good. 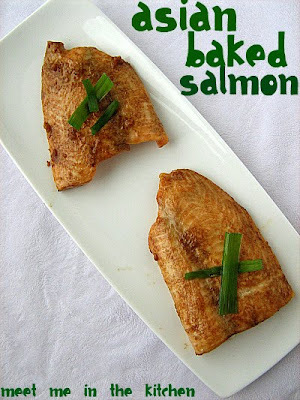 My kids and husband really loved this salmon. It was a definite success. I used salmon fillets without the skin. I just brushed my salmon with the marinade before I put it in the oven and after 10 minutes, flipped the salmon over and brushed it again. I baked mine at 400 degrees and it was done in 15-20 minutes. I saw the idea of Homemade Graham Crackers a couple of months ago and decided I would give them a try. I have mentioned my unfortunate "problem" with graham crackers here before, just that I like them a lot, so can't have them around. I guess I was just curious to see if the homemade version had the same effect. I used a recipe I saw on Smitten Kitchen and the dough came together easily. I realized when I was getting ready to roll out the dough that I had forgotten the +2 Tablespoons of flour and that is probably why my dough was so extremely sticky. I still managed to get some of it rolled out and cut. My crackers were done in about 15-18 minutes, so watch these. I didn't bake all the dough. I rolled some up and put it in the freezer for a later date. Now, about the taste and texture. 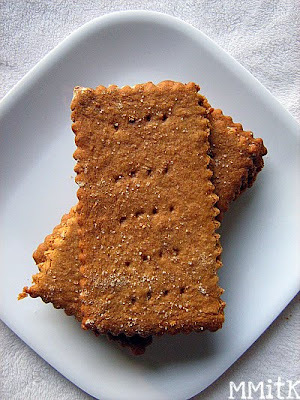 Did these remind me of store bought graham crackers? Not really. The texture wasn't the same and the flavor wasn't really that close, in my opinion. Were they yummy? Yes. Just not really what I would call graham crackers. I slliced some of the frozen dough into rounds and baked those, which produced a chewy cookie. My kids preferred the round cookies, which I didn't photograph. 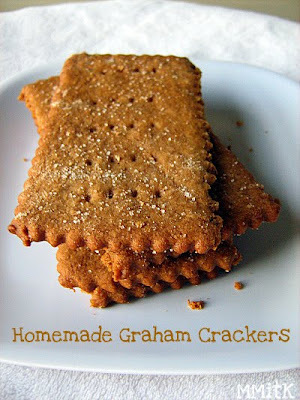 So, final answer on these- they don't really taste like graham crackers, but they are tasty. Bake them yourself and see what you think! Now, these graham crackers weren't alone. This wierd looking shake was the accompaniment. Have any of you seen The Best Thing I Ever Ate, on the Food Network? I don't watch a lot of tv, but this is one show that I really like. Basically it is just chefs and other food personalities talking about the best thing they have ever had in a certain category. It is pretty fun to watch. On one of the episodes- I think it was about sweets, someone mentioned a Toasted Marshmallow Milkshake and how it was so good, they immediately ordered a second one. I saw a recipe for this milkshake in Everyday with Rachael Ray magazine and once again, curiosity got the best of me. It is so simple and broiling jet-puffed marshmallows might just be the best idea ever. (I think you could easily do indoor s'mores using this method). I used slow churned vanilla ice cream and skim milk, and it turned out really good. My husband even requested that I make him another one the next night after dinner. 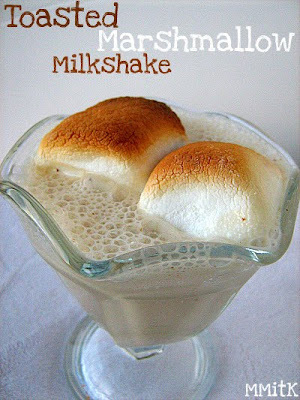 The Toasted Marshmallow Milkshake stole the show! A couple of weeks ago I really wanted to make beans and rice. I don't know why exactly, it just sounded like a good option for a weeknight dinner. I wanted to try Red Beans and Rice, so I searched for recipes online and in my cookbooks. I kept looking and looking, but most of the recipes I saw had some sort of meat in them, either just for seasoning or to go along with the dish. I wanted to try a recipe that was mainly just the beans and rice without any meat. Since I have been using my Mayo Clinic Cookbook a lot lately, I decided to look there for a recipe and found one, with a Caribbean twist. It also used brown rice, which made me really happy. There is a unique combination of spices and herbs in this version- allspice and cloves- which add part of the caribbean flavors, as well as the cilantro. I left out the hot sauce, mostly because I wanted my kids to be able to eat this without saying it was too spicy, but left in the cayenne pepper. I also just used one kind of brown rice, instead of a combination. You could probably substitute canned beans instead of cooking your own dried ones, just make sure to drain and rinse them and I would say use 2 cans. Soaking dried beans doesn't really take that much effort, you just have to remember to do it the night before you are planning to make the dish. 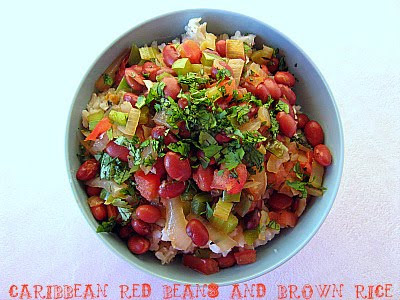 We really liked this version of red beans and rice. It was full of flavor and very filling. A great weeknight meal. Who is excited for Spring? Raise your hand and shout! I can't wait for spring to officially be here. If you know me at all, you know that I am not a fan of cold weather or snow. I love sunshine. I would rather be hot than cold. Sweat doesn't bother me at all. Chills and brrrrr- I am not a fan. This recipe made me feel tropical. And since spring is soo close (2 days away), I decided it wouldn't be too horrible if I posted this recipe with all these delicious fruits. 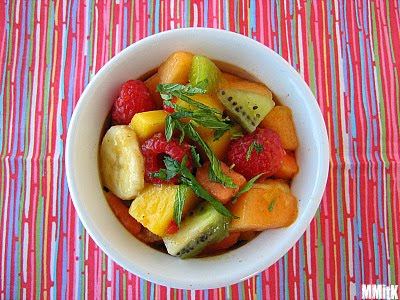 The picture for this recipe in the New Mayo Clinic Cookbook just really made me want to make this fruit salad immediately. The little flecks of vanilla bean and all the bright colors of the fruits- It looked absolutely heavenly. I noticed mangoes, papaya, raspberries, and kiwis at the grocery store and they were not too expensive, so I bought them. Throw in some canteloupe and banana and you are good to go. My girls helped me cut up the fruit, make the divine syrup, and stir everything together. They are such good helpers. The syrup that goes over the fruit calls for honey, lemon juice, orange juice, cinnamon, ginger, a vanilla bean and coriander. What? coriander? That was my original thought when I saw coriander on the ingredient list, but I was brave and I added it and it really added a little extra something to the syrup. The syrup reminded me of mulling cider when it was bubbling away on the stove. I loved that it wasn't overly sweet, but very full of flavor. It was warm(not temperature, but ya know?) and soothing, yet cool and refreshing all at once. It was unbelievable with the fruit and mint. I never would have thought to combine all these fruits, flavors and spices. It was amazing. The recipe said that the syrup was really great over pancakes. I was really hoping we could try it that way. But it just disappeared too fast. We eat a lot of asparagus. It is one of the veggies that my kids always ask me to buy, which I think is a little strange because I can remember hating it when I was a kid. Of course I have never told them that, I just buy it, cook it and we all eat it. When I saw the picture for these Egg in a Basket's' in Ellie Krieger's new cookbook, So Easy, I couldn't wait to make them. They were in the breakfast section of her book, but we had them for dinner. 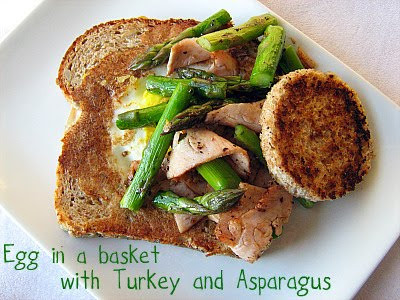 My mom always used to make the egg in a basket part when I was growing up, so I thought they would be even more delicious with the addition of turkey and asparagus. They were so good. We all loved them. I cooked my eggs longer than the recipe said to, because I don't like runny yolks. I made sure my yolks were completely cooked. That is just my personal preference. Feel free to cook your eggs however you want. I know there must be someone out there who likes having the yellow runny stuff all over their plate. They just don't live here. The best part is the little round cutout of bread that gets all crispy and delicious. We are going to be having this meal again for sure. oh, and Happy St. Patrick's Day a couple of hours early. We are going to have our traditional green eggs and ham, but this year we are going to have them on homemade biscuits. Not to mention a lovely spinach/arugula salad. And we are making homemade Mint Chocolate Chip Ice Cream with fresh mint. I can't wait. I hope you are wearing green and that you eat at least one green food tomorrow (later today)! Steam or blanch the asparagus for a few minutes, until crisp tender. Using a 2 or 3-inch cookie cutter, cut a hole in the center of each slice of bread; reserve the cut-outs. Spray a large nonstick skillet with cooking spray and set over medium-high heat. Cook the turkey slices until they are browned around the edges, about 3 minutes. Add the asparagus and cook until heated through, about 2 minutes, then season with the pepper. Transfer the mixture to a plate and cover with foil to keep warm. Place 2 of the bread slices and cutouts in the same skillet and crack on egg into the hole of each slice. Cook until the egg whites are set and the bread is toasted on the underside, about 3 minutes. Flip the bread slices and cutouts over and cook an additional minutes. Transfer to a plate. 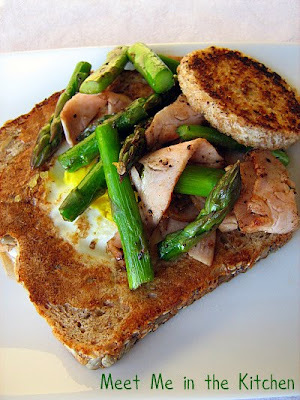 Repeat with other bread slices, cutouts, and eggs. Top each bread slice with 1/4 of the turkey/aspargus mixture and a cutout. This month's MSC Cupcake- Lemon Meringue Cupcakes, was chosen by Megan over at My Baking Adventures. I wanted to point out that the cupcake above is NOT Martha's recipe, but a recipe that I found in Everyday with Rachael Ray Magazine a couple of years ago, for Lemon Meringue Cupcakes. I posted about these twice before- you can read more about them HERE. I debated trying Martha's recipe too, since the RR one's were a complete hit- but I didn't have anywhere to take them or anyone to share them with and when I compared the recipes side by side- they were almost identical. So, I guess in a way I am cheating, because I didn't really make this month's cupcake, but I thought these were close enough that they could count. The version I did make were so delicious and quite a hit with all those who tasted them. I don't often repeat dessert recipes, but these were so good that I have made them more than once. Check out the MSC Blogroll to see everyone else's results! Snickerdoodles are something that I remember having a few times growing up, but they weren't my favorite cookie or anything. Some people feel different about them. 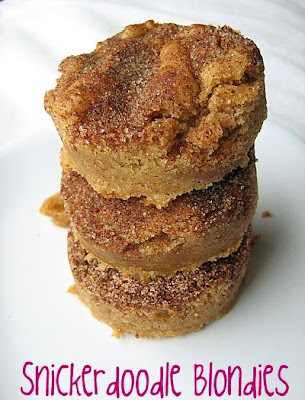 I saw these on The Recipe Girl's site and she is definitely a fan of snickerdoodles. You should read her post, it is really cute. I made these on a friday afternoon, for an afterschool snack, just because. I made 1/2 of the recipe and baked them in my 8x8-inch pan. I might have underbaked them a little bit, but I ended up putting them in the fridge to help them firm up a little bit and they were fine. I used one of my biscuit cutters to make little round cookie bars, instead of squares because it just makes it a little bit more fun. These were a great little treat that my kids really enjoyed and they tasted even better the next day. It's been so long since I have had a snickerdoodle that I can't really remember the exact flavor, but I think these taste exactly like their name- a snickerdoodle-y blondie. Tuna is one of those foods that kinda gets a bad wrap for some reason. Tuna salad too. I understand it, because some people's only memory of tuna is something that is smothered in that horrible white stuff (mayo), which I find absolutely disgusting. I think tuna has lots of possibilities and we eat it often at our house. If we are having plain old tuna sandwiches, I always mix it with a minimal amount of plain yogurt (don't like it sopping wet), add lots of chopped celery, dill pickles, to add some crunch and make sure there is lettuce and toasted bread involved. Canned tuna can be so delicious is other ways too. It can be wonderful in pasta dishes and you can never go wrong with a vinegar/olive oil dressing to perk up your tuna salad. This was inspired by something I saw in a magazine briefly, but I didn't have the magazine with me when I was mixing this up, so I guess I was just inspired by it. The radishes and lemon zest give a nice boost of flavor, and garbanzo beans round out the whole thing. My girls helped me mix it up and they ate the other half of the garbanzo beans while we were fixing this. I didn't measure out the vinegar and olive oil with measuring spoons, I just drizzled some into the salad, and then we tasted it to see if it needed more. We used more vinegar than oil for sure. My kids really liked this, as did my husband. This was a no utensil night, since we ate these with our fingers. 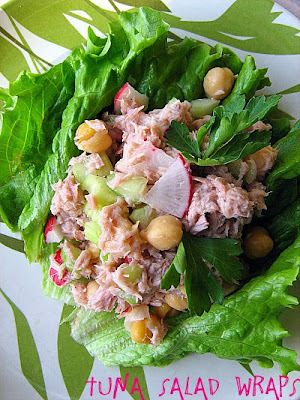 Combine celery, radishes, tuna and garbanzo beans in a large bowl and mix together. Add lemon juice and zest, a few dashes of vinegar and oil, and season with salt and pepper. Stir together and add more vinegar, oil, or salt/pepper- to taste. Serve on large lettuce leaves and wrap to eat. I don't remember the first time I tried it, but it was love at first bite. It combines some of my favorite things- tomatoes, cucumbers, parsley, and lemon juice- to make a very light and refreshing salad. I found this particular recipe in a cookbook I have on my shelf, The New Mayo Clinic Cookbook: Eating Well for Better Health. This cookbook is full of beautiful pictures and healthy dishes. This particular recipe has more "vegetables than grain" and it is suggested you serve it on lettuce leaves or in a pita. I think it is great on its own. I made this as a side dish to take to a family dinner and lots of people tried it for the first time and loved it. This can be made ahead and it really didn't take me very much time to throw it together. The bulgur has to soak for about 15 minutes, but during that time you can chop the herbs, vegetables and get everything else together. I was secretly hoping that there would be lots of leftovers, but everyone enjoyed it so much, that I only had a little bit left to have for lunch later that week. 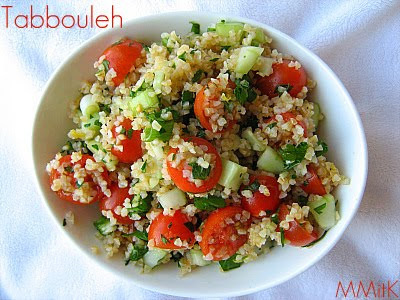 I will definitely be making this version of Tabbouleh again. It was perfect. * you can find bulgur at health food stores in the bulk section, or you can buy a box of Tabbouleh and save the seasoning pack for something else, just using the bulgur. I just can't seem to throw away leftover frosting. And in my house, there is always leftover frosting after we have made cookies or cupcakes or whatever. Always. Not a lot of frosting, but a couple of tablespoons or 1/2 cup, just enough to warrant a little plastic container, a lid, and a nice stay in the refrigerator. Such was the case with this Vanilla Bean Cream Cheese frosting that I made a couple of weeks ago to be sandwiched between some of these Red Velvet Whoopie Pies. This frosting was the more popular one between the 2 we had that day and it is one of the best frostings I have made recently. It has just a enough cream cheese flavor, but not overpowering and the vanilla bean is magical, somehow intensifying the flavor. I absolutely love those little black flecks the vanilla bean leaves behind. I decided to make some mini cupcakes, a recipe I have made before- Martha Stewarts One Bowl Chocolate Cupcakes. I made a 1/2 batch of the cupcakes and had just enough frosting to give each mini cupcakes a cute little dollop of frosting. 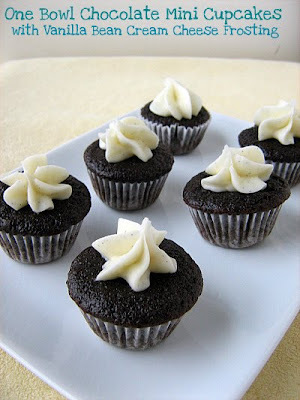 The combination of this cupcake recipe and the frosting was really good. Plus, when treats are this small you can get away with eating 2 or 3 and not feeling very guilty since they are so small and cute. Beat the cream cheese and butter with a mixer until smooth. Beat in the confectioners' sugar and vanilla seeds. Sometimes the cover recipe on a magazine just draws you in and you have to make it. That is the story with this pasta dish. It was on the cover of Everyday Food a couple of months ago. 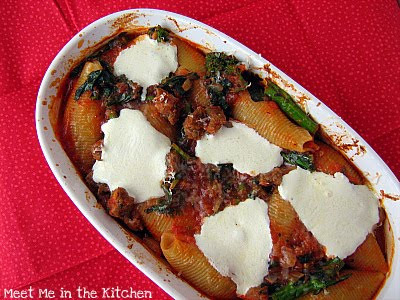 Something about cheesy baked pasta is really appealing. Throwing in something green makes it even better. I used turkey sausage in this recipe because I use ground turkey and turkey sausage in place of ground beef or pork always. It is a way to cut back on calories and fat, without getting rid of the flavor. The broccoli rabe was a little much for my kids in this one. It can be bitter, although blanching/steaming it for a few minutes is supposed to help with that. The recipe suggested subbing in regular broccoli, if preferred, but I think spinach would also be a good alternative. You could also sub another type of cheese, since fresh mozzarella can be expensive. This turned out to be a recipe that looked better than it tasted for us. We still liked it, but I was expecting more from it, for some reason. I would like to play around with the recipe in the future and make a few changes, to see if I could get better results. It was good, but not as amazing as the photo made me think it would be. I saw this recipe in Everyday with Rachael Ray Magazine and knew I had to make it as soon as possible. 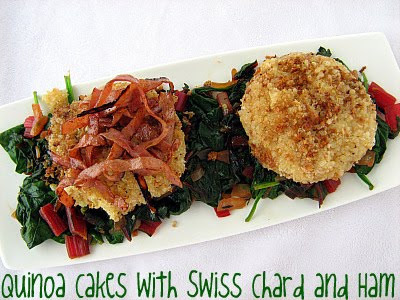 It combines two of my favorite ingredients- quinoa and swiss chard. I didn't really follow the recipe. The recipe wanted caramelized onions, but I don't really care for those, so I kinda just did my own thing with the swiss chard and ham. I followed the recipe for the quinoa cakes though. I used Ellie Krieger's technique for making the ham crispy that I first discovered when I made her Cobb Salad. Basically, you slice the ham and cook it in a hot skillet, coated with cooking spray until it gets nice and crispy- it only takes a couple of minutes. I cooked my swiss chard like this- making sure to keep all the beautiful stems in there, since they get nice and tender and yummy. The final outcome was a really delicious dish. You can leave off the ham pieces and make sure you cook the quinoa in vegetable broth and it makes a really great vegetarian dish. Either way- this was a great success. Really pretty with the chard and really tasty too. 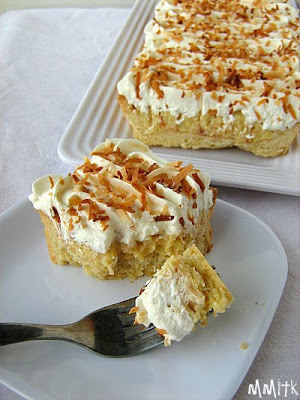 This week's TWD recipe, Toasted Coconut Custard Tart, was chosen by Beryl, who blogs over at Cinemon Girl. You can find the recipe for the custard and topping, slightly adapted on her blog- HERE. 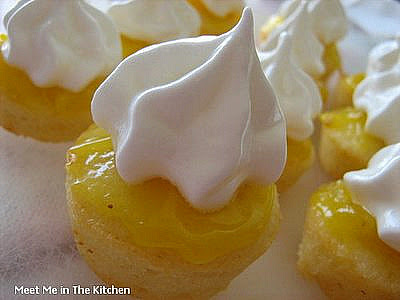 You can find a great post and the recipe for the Sweet Tart Dough- HERE (minus the lemon zest). This was the tart that I almost made and then didn't and then did- again and again and again. I knew that our family couldn't eat the entire tart, so I didn't really want to make the whole thing and then I talked myself out of making it entirely because I am trying to eat less sugar. Not baking makes the don't-consume-sugar thing a tad bit easier. But, I really wanted to make it because tarts are so pretty. They might be my favorite thing to make at the moment. I have made pastry cream/custard a million times. The tart crust- no problem. 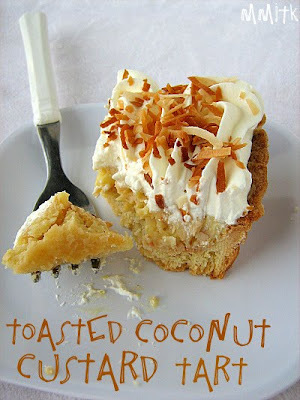 I just needed someone who loved coconut that would take the tart off of my hands. I asked my hubby if his boss liked coconut. He said yes. I knew I wanted to use my rectangular tart pan, so I made 2/3 of the custard (also because I only had 5 eggs and needed one for the tart crust). I made the recipe as is, except for the rum. I omitted it from the custard and the topping. I added a little bit more vanilla extract instead. My girls helped me make the custard, crust and topping. We put it all together and took it to my husbands work. My daughters made sure that we kept a couple of little square pieces for us, which is one of the main reasons I wanted to use this particular tart pan- you can cut lots of smaller squares and it ends up serving more people. I didn't try the tart or any part of it. But my girls did and they loved it. Hubby's boss loved it. And I am sure it was good because I have tasted Dorie's pastry creams/custards, crusts and toppings before and they are magnificent. 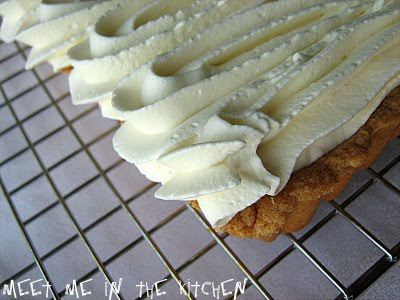 Check out the TWD Blogroll to see who else loved this tart!